... but lots of stuff happened today =\ so there we go. Lots of Loot dropped , too bad 50% of it wasnt needed by anyone. And no my guild does not need to use gimp zoning tactics to kill this guy! "Wow nice, there is a zone to shissar temple over here" someone said. 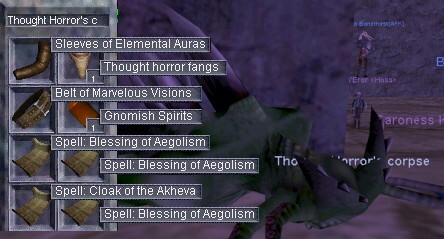 So we decided to pay the bosses of level 1 and 2 a visit for leet spell and not-so-leet loot farming. Also, yesterday tormax fell again, we are teh win. And that was only today and im sure i missed a few :| poor druid!